A brief background is in order. I raised Rhode Island Reds all through high school for my FFA project and was lucky enough to win a $500 scholarship doing something I loved. Now I am trying to teach my five year old son the joys of tending his own flock....and we're dragging Mom along for the ride! We have 3 acres here in rural Chester County, Pennsylvania. There are 3 boys in our family-ages 19, 14, and 5. We share the property with my mother who lives in a detached apartment. There are 4 dogs too! 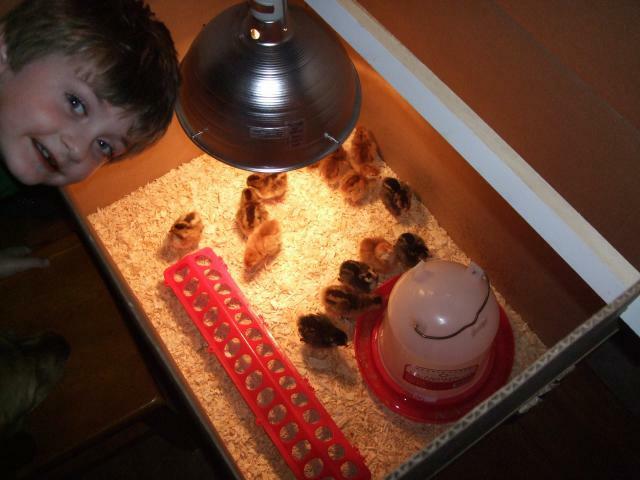 Here is my son Dylan with his brand new peeps! Here's a close up of our flock....8 RIR's, 5 GLW's and 5 Speckled Sussex. Supposed to be 1 SS roo in the bunch but I haven't found him yet! 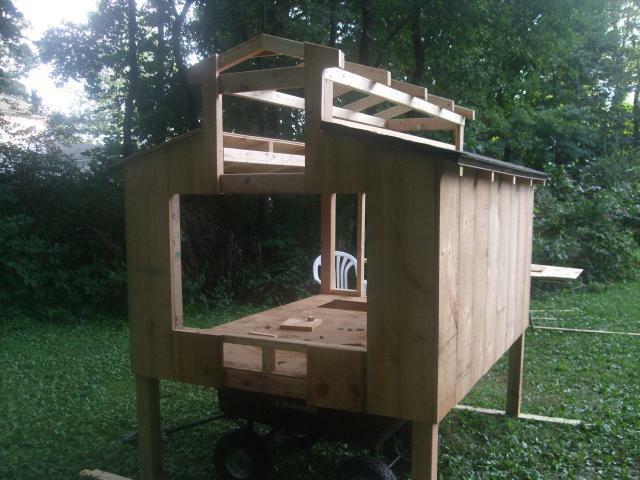 We had to get started on our new coop right away! It will be raised with a shaded run underneath. 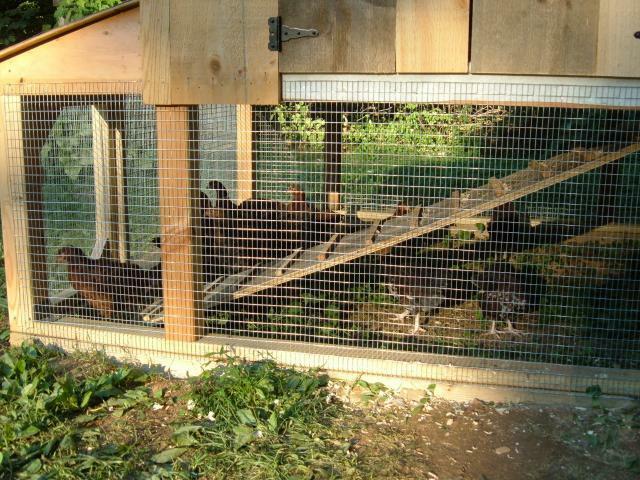 Although we plan on letting them free range most of the time. 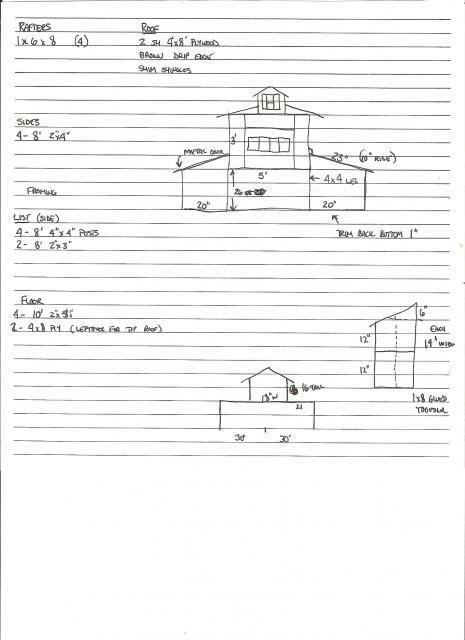 Our coop started with a rough sketch on scrap paper. I have been a builder and house framer for 15+ years and built houses on less sometimes! 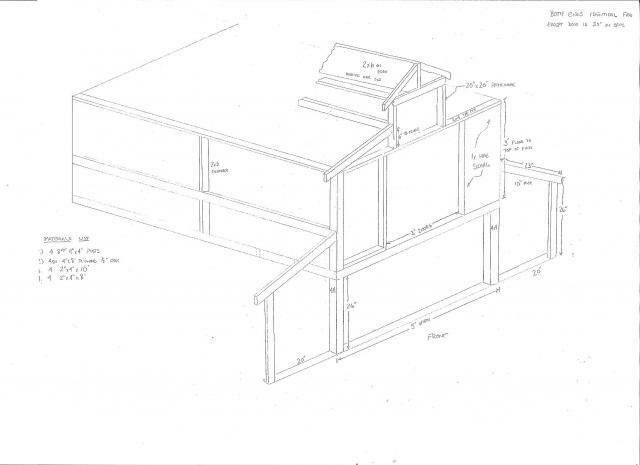 I then took our sketch drawing and laid out a framing drawing for my reference as we build it. I had materials on hand or because I could save something(time, money or sanity) by doing it this way!!! Here is the proud owner of 18 new baby peeps with his new coop in progress. He's a great helper! 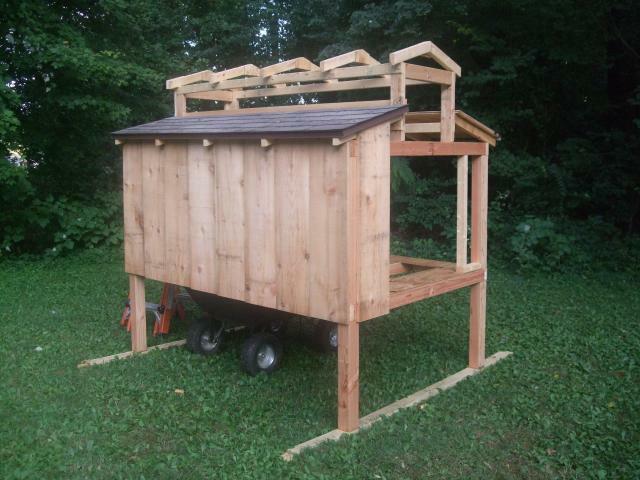 Here the lower roof is complete and you can see the raised cupola that runs the length of the coop. Now it's time for some siding...in rough cut pine w/ battens to match the house. 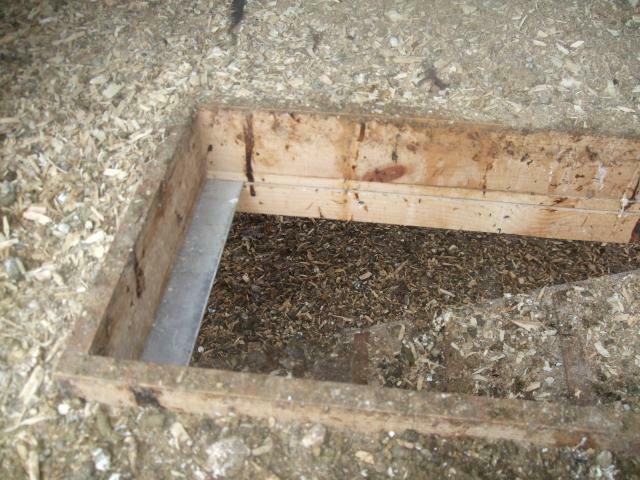 This view shows the area left open for the exterior nest boxes which will swing out as a unit to facilitate cleaning. 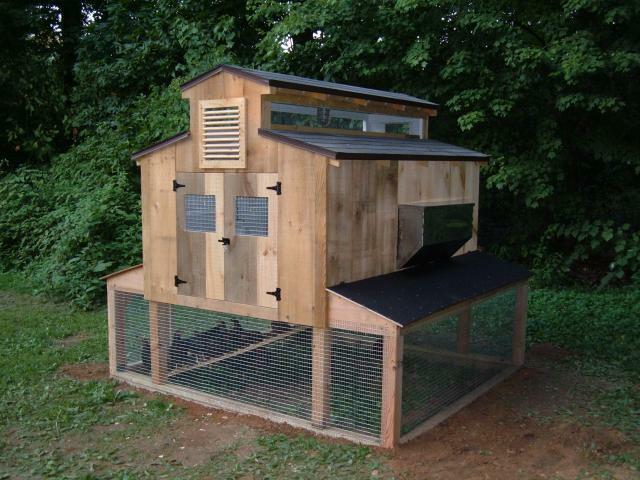 They will also have access doors for Dylan to get his eggs each day. 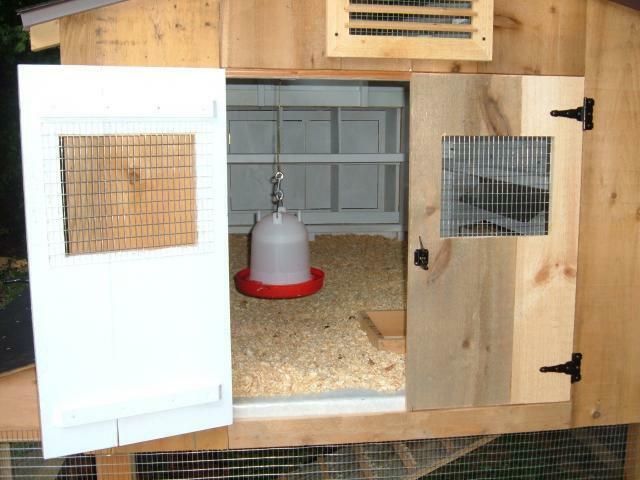 This image shows the areas left to be sided and the access door cut in the floor that will lead to the enclosed run for his chicks. You can see it is just tall enough to get the wagon under for cleaning. 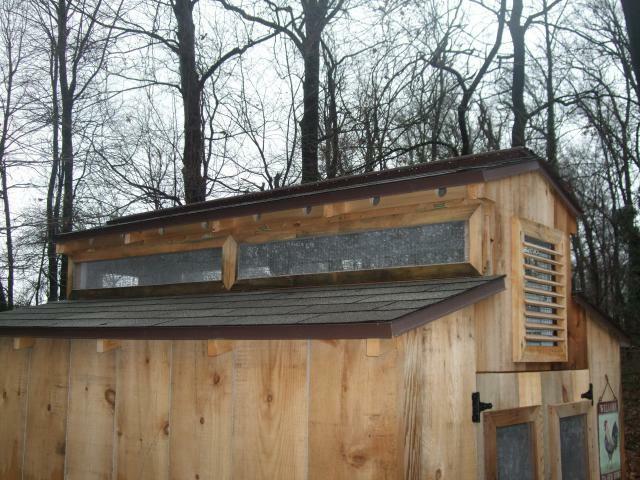 Here is the rear showing the nest boxes. 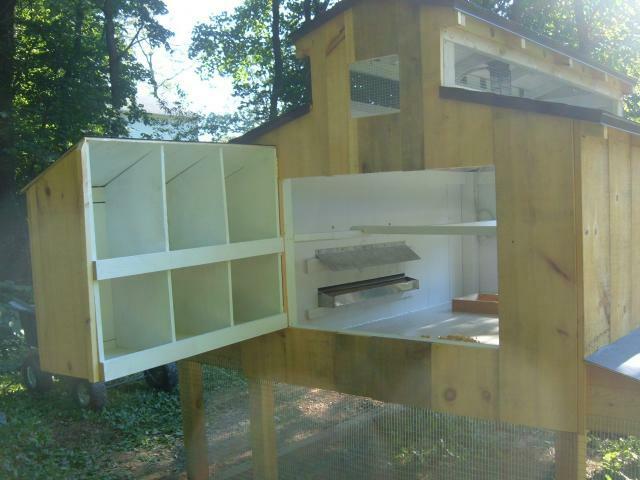 And the whole thing swings open for cleaning access...You can also see the exterior feeder and shield with the installed roosts. 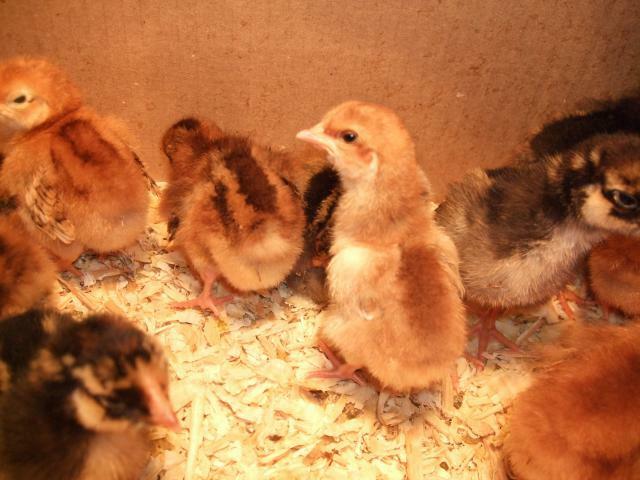 The chicks are moving in!!!! 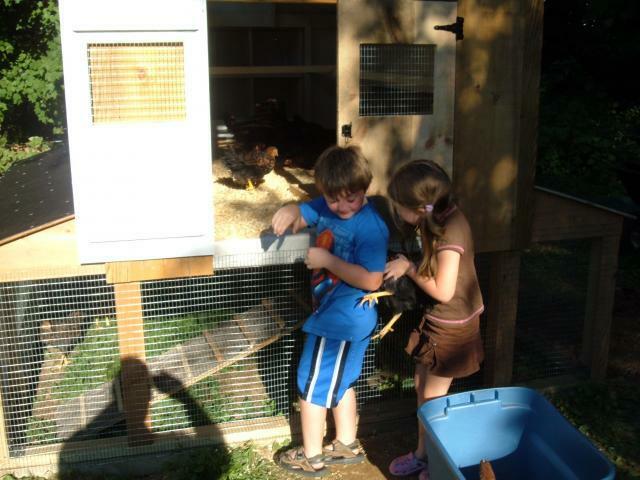 Dylan and his friend Abigal are putting them in for their first time. They're not to sure about this yet but they sure do like the room! The front view from the yard. Here are a couple inside shots. 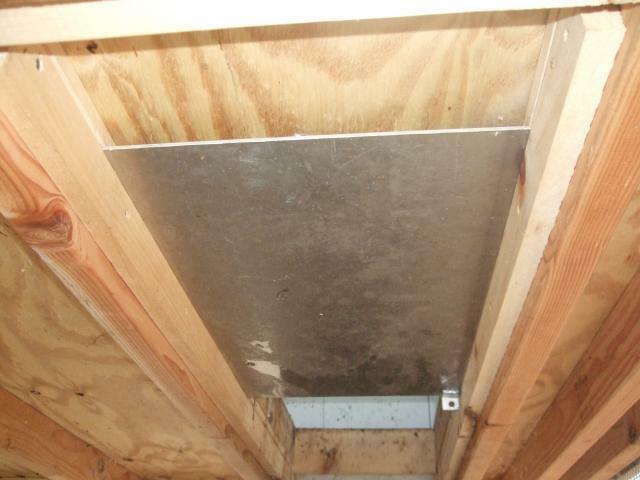 Here is the pop door from the underneath. Here are the upper vent windows. 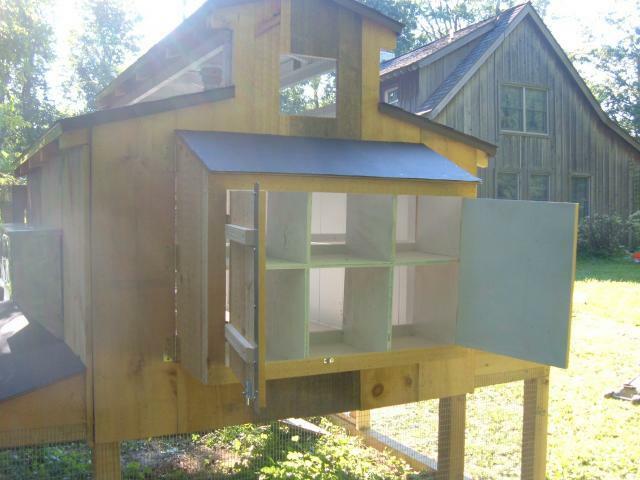 Here are the windows open with the built in props and the metal ridge vent is visible. 2- 2x4's treated for footer boards to stand the 4x4s on. 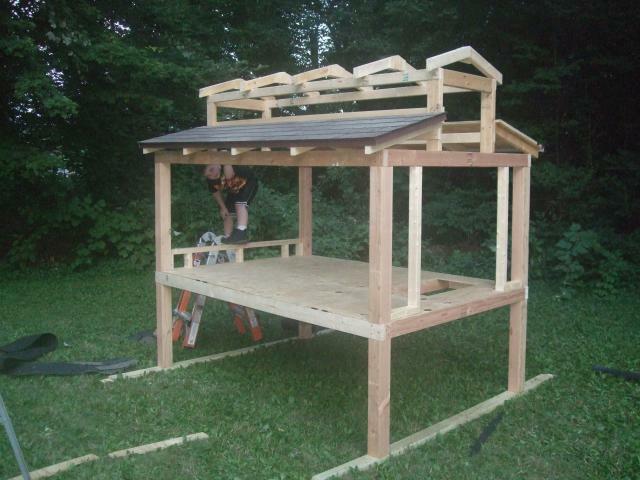 Second round was roofing, siding and such. Most siding was leftover from house and garage construction in 2000. 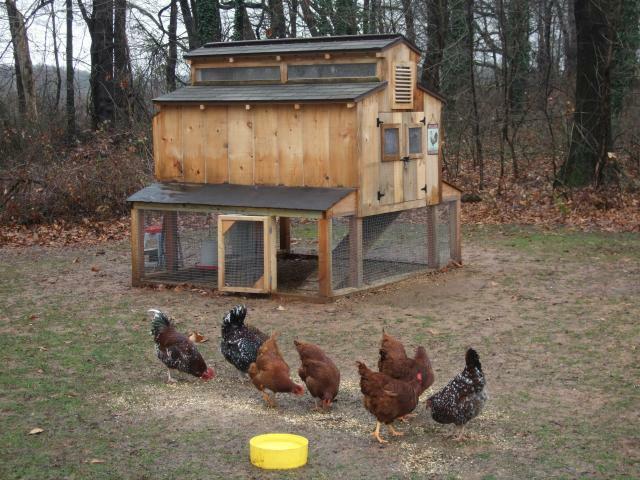 Being able to sit in a chair and watch the chickens scratching while you admire your handiwork...PRICELESS! more slope away from the run underneath. 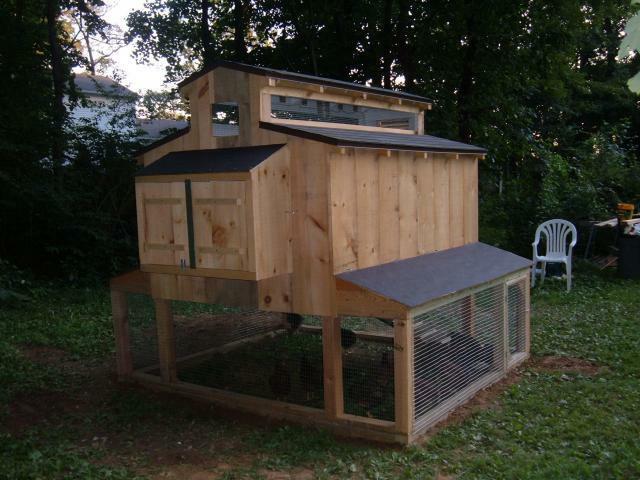 I would have put the sand in underneath before the coop was finished! Birdicus 7 would this be big enough for 22 chicks? Any chance you could send me the plans? I can't seem to get my computer to pull it up without it blurring everything. We have a 5 x 5 coop over run that we had for our older 4 (3 now, lost one to a predator today) but just got 15 + 4 coming in 2 weeks chicks. We want to let them free range as much as possible but after losing one to a predtator today I'm scared. Is the coopula on top just for ventilation? We have uneven ground so I was considering putting the 4x4s in the ground and just leveling above. Do you think that will work? I just want to make sure that the girls have someplace to be while they grow because we have lots of birds of prey flying overhead. I appreciate any help you may offer. To Istinthot- The nest boxes drop about 1/4" when I open it but doesn't really sag. You can't tell in the photos but when it is closed the weight sits on the bottom pieces of siding to carry the weight. To Juliefarms- This coop is quite heavy. 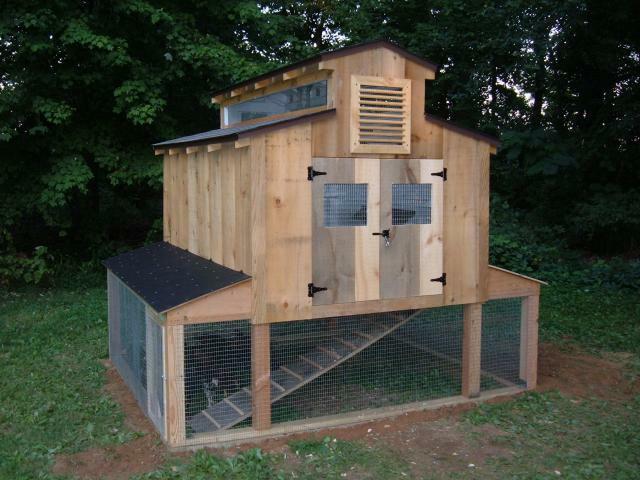 It could be easily lightened up by going to thinner materials, use 3/8" exterior ply for the sides and you would cut the coop weight in half. The 4x4's could be 2x4's etc. I can move it if I want by jacking it up and placing it on 6" diameter sections of PVC piping and I can push it wherever I want but it's not something we do. Bookmarked, you used all the space so well. I really love this, what a practical design! How hard would it be to move? Wondering if you had any suggestions on how to make something like this lighter. The tractor's I've seen aren't what I want, but would like something that could be moved to a fresh spot every month or so instead of doing sand.. Thank you for the design. 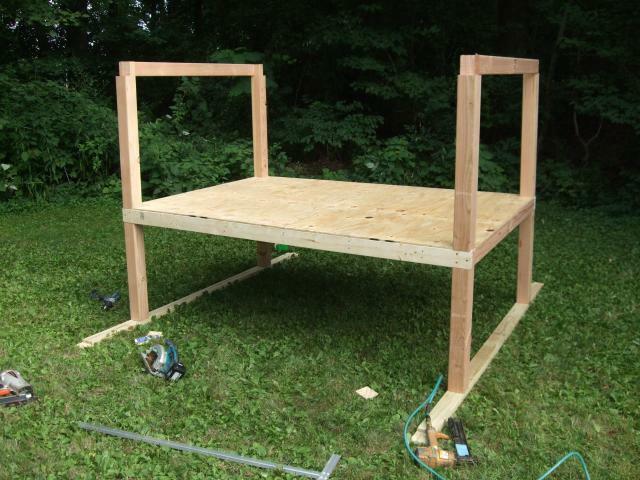 We are just about finished building one that looks like this one. Took two days to get most of the build done. 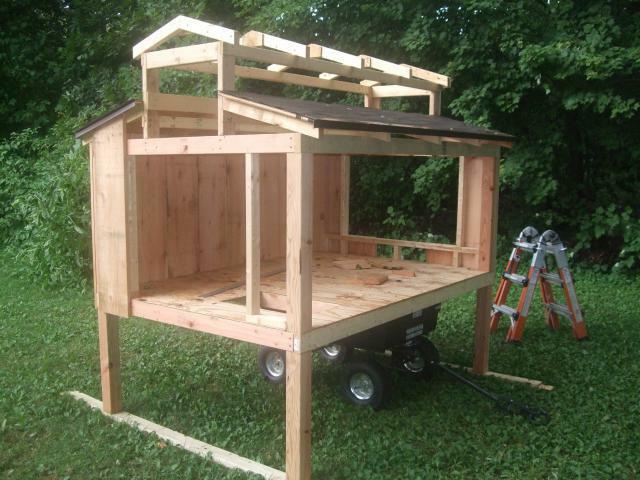 Only thing left is the lower part for the chicken run and shingle the roof. 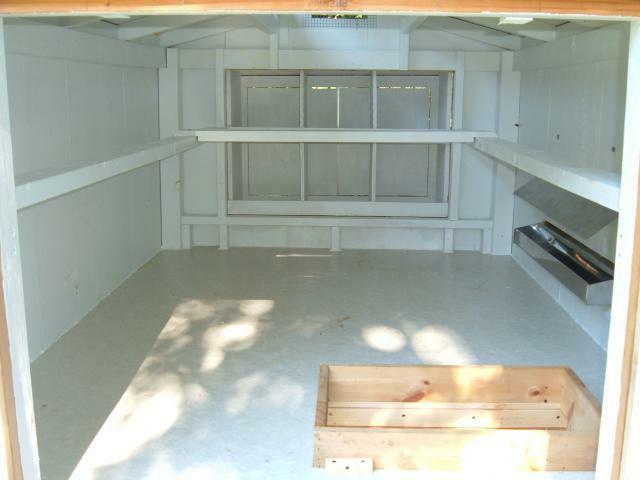 We were not able build it as cost effectively as you. We have about $750 in materials right now. Not much re purposed wood used for ours and no left over siding. 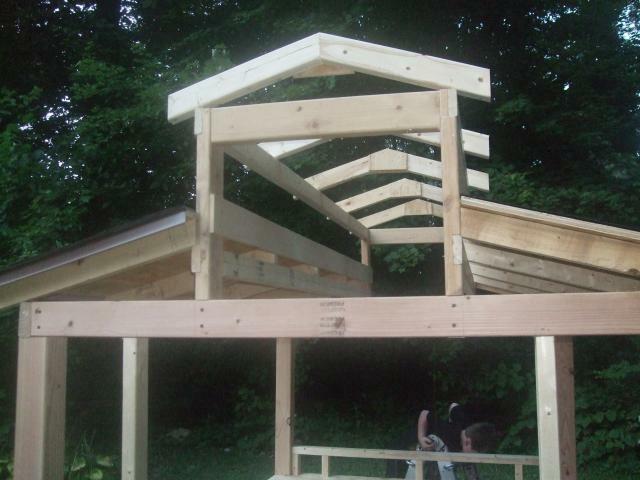 We did have some screws, hurricane straps and shingles though. 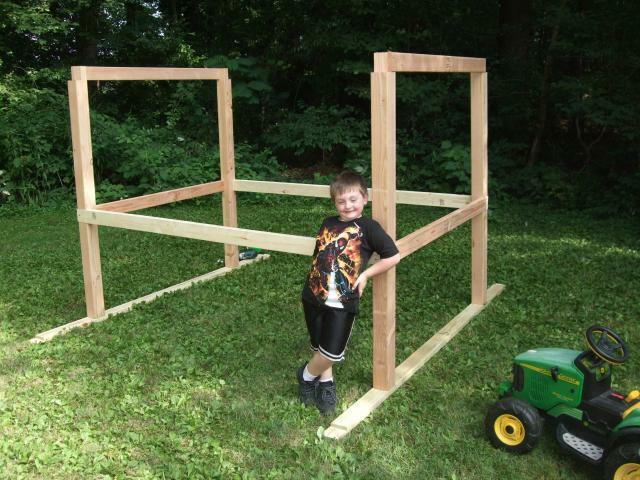 We added 6 inches to the run height and about 3 1/2 inches to the inside height. 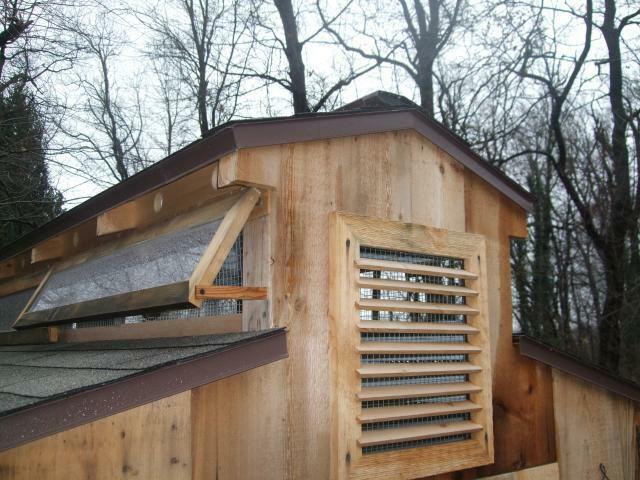 We added a ridge vent and soffit vents. We live in Virginia and wanted to make sure the heat could get out in the middle of the summer. 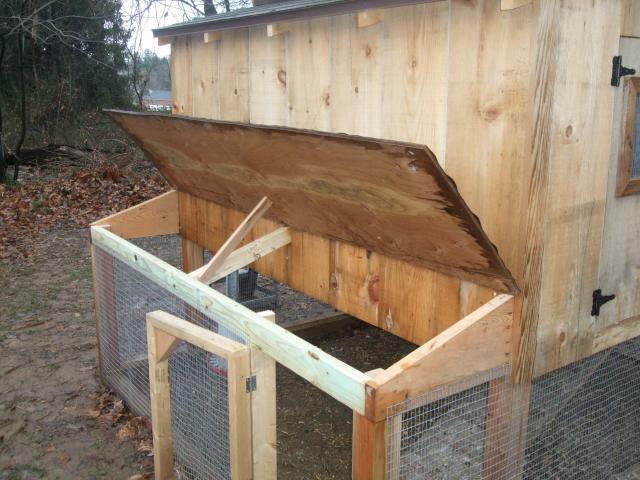 Did the hen box door sag when open? I ended up putting a 2x3 across the bottom of the door attached to the house to hold it level while closed. Ours door does sag some while open, the board removes the extra weight when closed. 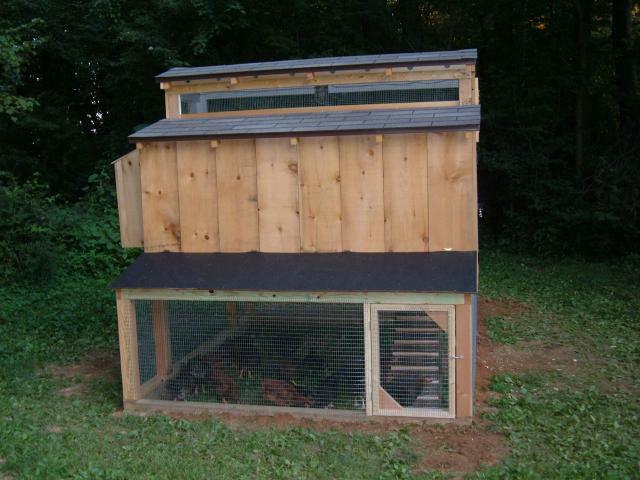 Again thank you for the idea, our 5 little chicks will like this coop and are planning on inviting more to come and stay! 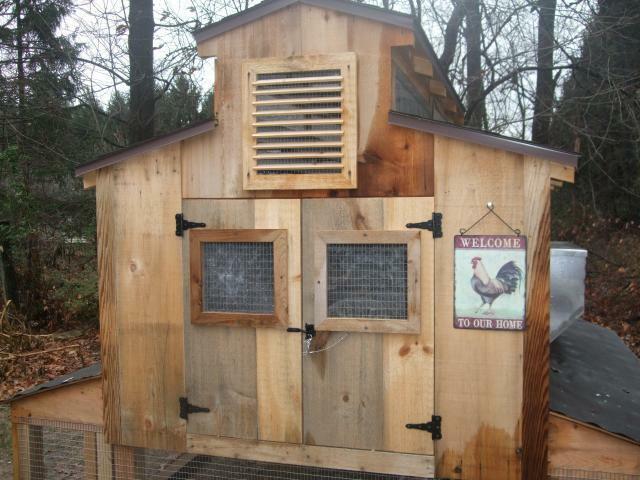 I LOVE this coop! My favorite one. Here's hoping my husband can duplicate it.